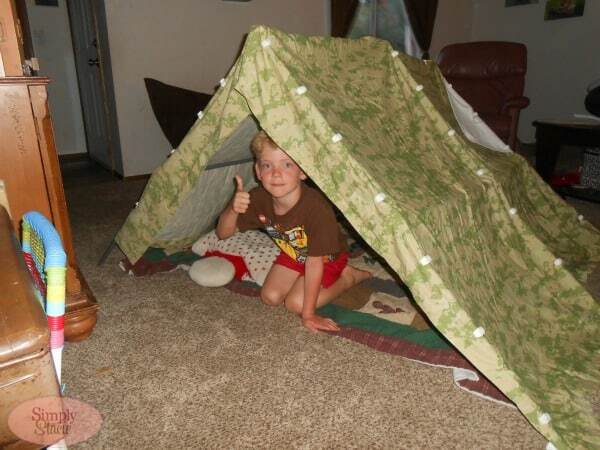 It’s no surprise that kids love to build forts. I remember when I was a child spending hours playing in a fort my sisters and I built in the rec room. We would use couch cushions blankets, chairs to build our makeshift fort and then play with our Barbies in there for hours. The forts weren’t the nicest to look at and were held together precariously and one wrong move could cause the whole contraption to tumble down. Fast forward to today and kids still love to make forts, but there’s a better way to do it now thanks to Fort Magic! 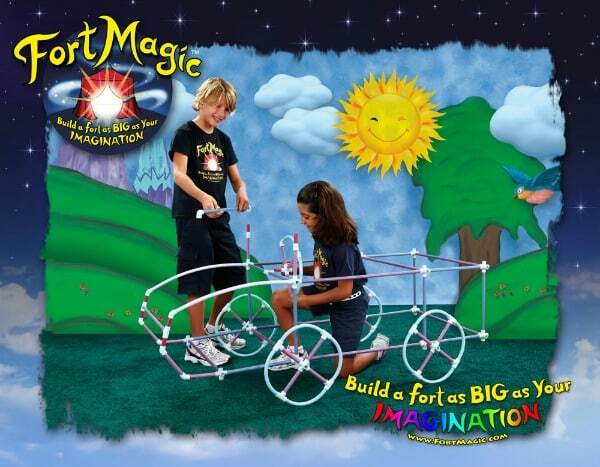 Fort Magic is an innovative fort building and construction toy that enables kids to build 3D, kid-created, “life-size” worlds for inventive play. 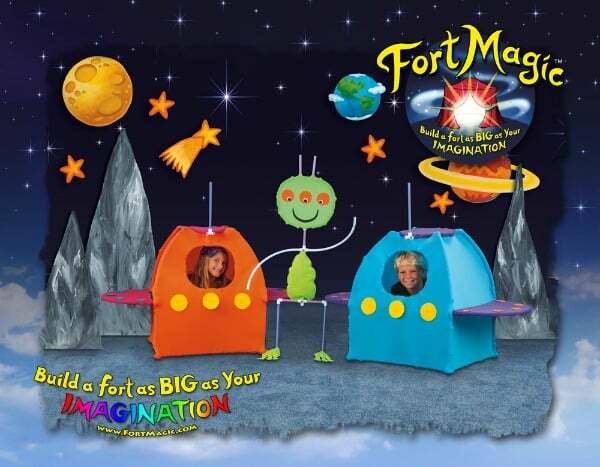 What sets Fort Magic apart from other building and construction toys is the unlimited building potential to invent “life-size” creative designs. 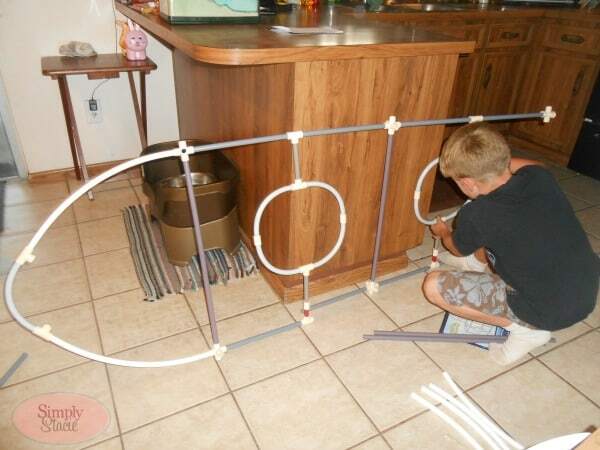 It’s a patented toy that both inspires and entertains children for hours of play. 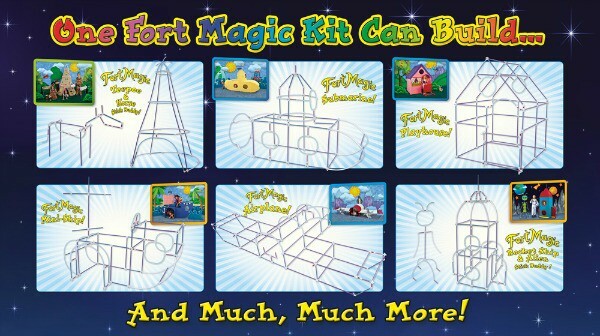 Children can build “forts” shaped like pirate ships, castles, playhouses, airplanes, teepees, tunnels and much more from ONE Fort Magic kit! The forts are easy to build and easy to clean up. My 9 year old daughter, Bridget, is a creative little girl. She’s loves arts and crafts and enjoys working on projects with me and on her own. 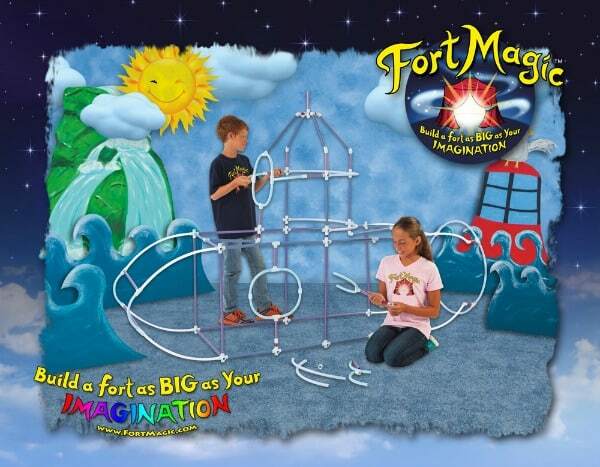 I think Fort Magic would be a perfect for her to inspire her to develop her creativity. Fort Magic’s mission is “Building Greatness in Children One Fort at a Time” and I believe that this is a product to help her grow her confidence as well as giving her hours of fun! 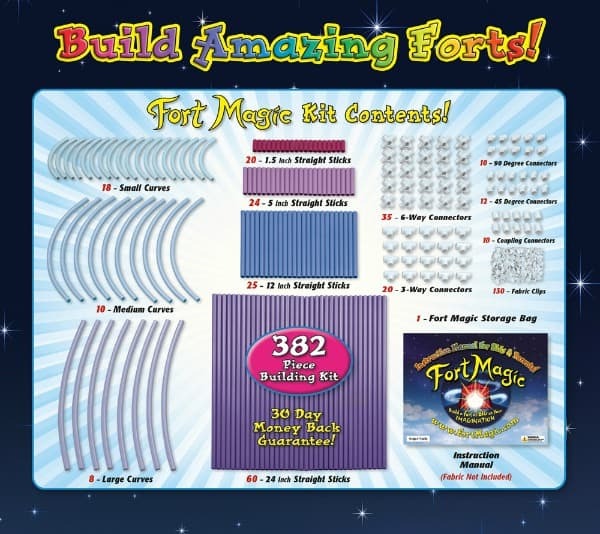 I think it’s fantastic that one Fort Magic kit allows kids to build unlimited designs. They can let their imaginations run free! 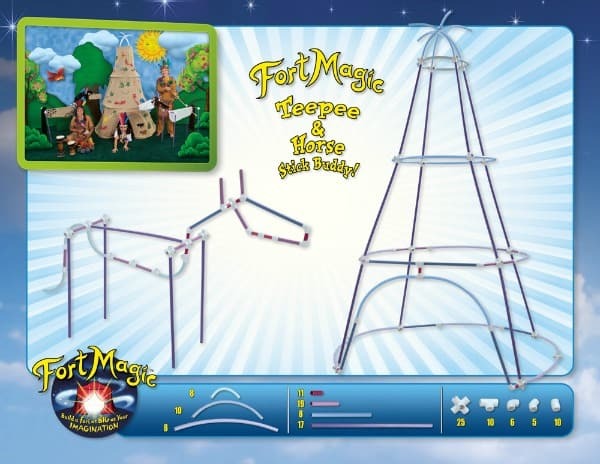 Fort Magic kits come with a large variety of sticks and connectors which gives kids free reign on their creations. Please note that fabric covers are not included. All Fort Magic kits come with a 30-day Money Back Guarantee. In addition, Fort Magic is also safety certified. The Fort Magic kits have gone through rigorous testing to ensure that every safety measure has been met. All tests have been performed by a third party independent lab approved by the Consumer Products Safety Commission of the United States. Want to see fort building in action? Check out this video! The proof is in the rave reviews! 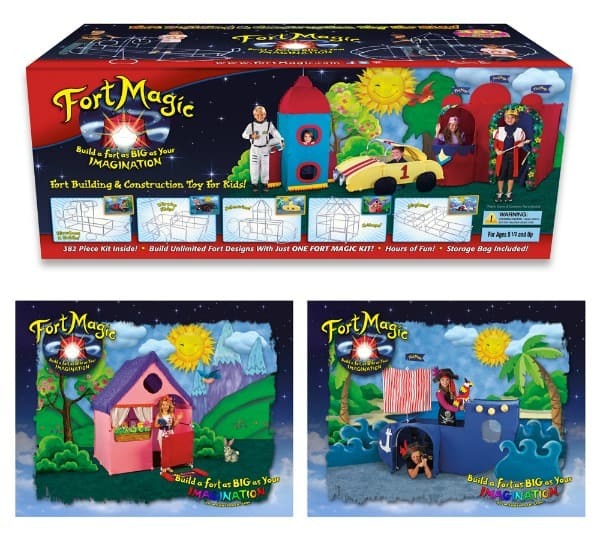 Maureen from my site reviewed a Fort Magic kit in July 2013 and it was a hit with her three children. She even stated that “Fort Magic is one of those rare toys that my family has come across over the years that I will be sure to save for use in the future with my grandchildren” and “all three of my children unanimously agreed that Fort Magic is their “favorite toy ever” and this is the first time I have ever heard this declaration from them about any toy”. Fort Magic also has repeated “five star” ratings on Amazon and people are raving about how their kids have been using Fort Magic daily for months and even over a year! 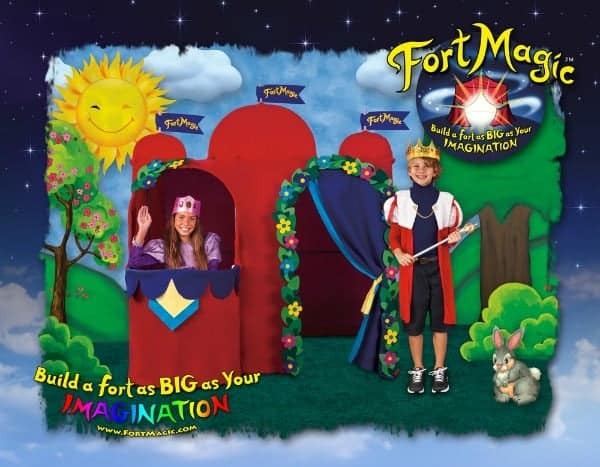 Fort Magic is definitely a boredom buster! Just look at these cool forts kids can make! Want to buy a Fort Magic kit? You can do so right on the Fort Magic website. They have a link to buy on Amazon and directly from Fort Magic for $199! I think my daughter would love this. I like how you can create different designs. I love that so many forts can be made with the same kit. SO much fun–and girls and boys would equally enjoy it!